1. The service is free and the process is simple. 2. You will receive a free, no-obligation quotation for your new boiler. 3. We only send your enquiry to Gas Safe™ Registered Companies. Combi boilers or combination boilers as they are properly referred to, combine a very efficient water heater with a central heating boiler in one compact unit. Combi boilers are now the most popular choice of gas central heating boiler in the UK due to their efficiency, relatively small size and because they do not require a separate hot water cylinder or a cold water tank in your loft. 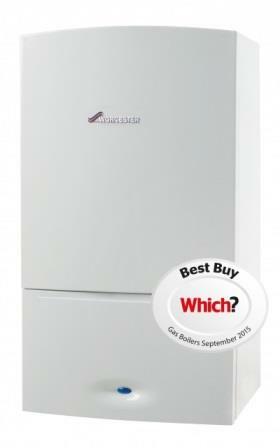 Combi boilers are ideal for small and mid-sized homes with up to four bedrooms. Combi boilers provide instant hot water at your taps by taking cold water straight from the mains and heating it up almost immediately when a hot tap or shower is turned on. Combi boilers are effectively on standby when there is no demand for hot water but fire up as soon as a hot tap is turned on, making hot water available all of the time. And because cold water is taken directly from the mains and heated up for your shower, hot water is delivered at mains pressure so there is no need for a pump to enjoy a power shower experience. Combi boilers take cold water from the mains and pass it over a very efficient heat exchanger which quickly heats the water up so that it can be delivered at your taps almost without you noticing a time delay. Combi boilers therefore do not need a hot water tank to store hot water and this makes them more efficient. No hot water tank means no heat loss from it but it also means that you cannot have an electric immersion heater as a back-up for hot water. For your heating, combi boilers heat water up and pump it around pipes to your radiators in a completely sealed central heating system. The combi boiler has its own expansion tank incorporated into it which means that there is no need for an external expansion tank in your loft. This not only saves space but also eliminates any risk of freezing in cold weather or leaking in your roof space. Whilst your central heating is switched on, the combi boiler will heat water up and pump it around your central heating system but if a hot water tap is turned on it will temporarily stop circulating hot water around to your radiators. Unless you run a hot tap for a long time however, you should not notice any reduction in heat in your home from your gas central heating system. Combi boilers are a type of condensing boiler which means that heat is taken from waste gases to pre-heat water returning from your radiators back to the boiler. This pre-heated water therefore requires less energy and hence less fuel, to heat it up to the required temperature before it is pumped back around your central heating system. This makes condensing combi boilers much more energy efficient than non-condensing boilers. Also, because combi boilers do not need a hot water cylinder there is no opportunity for heat loss from one. Hot water is available at your taps and shower at all times. Combi boilers only heat water for your taps as and when you need it so there is no heat lost from stored hot water. This reduces gas usage and helps to lower your heating bills. Hot water is delivered to your taps at mains pressure, so as long as your mains pressure is adequate you can enjoy a powerful shower without the need for an additional pump. Combi boilers are generally compact in size and some can fit inside a standard kitchen cupboard, so saving room. There is no need for a hot water cylinder to store hot water or for a cold water expansion tank in your loft. Combi boilers are generally less expensive than system boilers of the same heat output. Because combi boilers heat the water for your hot taps ‘on demand’ and at mains pressure, they don’t cope well if more than one hot tap is turned on at the same time. The rate of flow of hot water will be reduced because of this and its best not to turn a hot tap on whilst someone is having a shower or trying to run a hot bath. Although combi boilers don’t need a hot water tank, it also means that you can’t have an electric immersion heater as a back-up for hot water at your taps. Combi boilers are currently not compatible with solar thermal water heaters. System boilers form part of a sealed heating system and they heat water to be pumped to your radiators for central heating. They also heat water which is then stored in a hot water cylinder to be used when needed. Being part of a sealed central heating system, system boilers do not require a cold water expansion tank in your loft. A pump required to supply hot water to your radiators and an expansion vessel are contained within the system boiler casing. In all other respects, system boilers provide central heating for your home in much the same way as a regular boiler does. Regular boilers are also known as conventional boilers, traditional boilers and heat only boilers. Unlike combi boilers which heat cold water directly from the mains supply and provide it at your taps as soon as you turn the hot tap on, systems boilers heat water and store it in a hot water cylinder or hot water tank for use later. Most hot water cylinders are fitted with an electric immersion heater which can be used as a back-up to your system boiler in providing hot water. Immersion heaters can also be used to provide hot water at times when your boiler is switched off or is not working. Because system boilers produce hot water and store it for when it is needed there is potential for heat loss from the stored hot water. That’s why it is important to have your hot water tank properly lagged or insulated. Nevertheless, your hot water supply is always limited by the size of the hot water tank and if it is all used, you will have to wait until the system boiler heats up more hot water. System boilers are also compatible with solar thermal water heating systems because they need a hot water storage tank. With solar thermal water heating systems you use energy from the sun to heat liquid in tubes on your roof and this heat is transferred to hot water which can then be stored in your hot water cylinder, thus saving gas and reducing your energy bills. In terms of supplying hot water to be pumped to the radiators in your central heating system, system boilers work in a very similar way to combi boilers. Modern system boilers are also condensing boilers which means that heat from waste gases which would otherwise have been lost to the atmosphere, is used to preheat water returning from your radiators. This means that less energy and therefore less gas, is required to heat the water up to the required temperature before it is pumped back to the radiators. Condensing system boilers are much more energy efficient and therefore less expensive to run than old non-condensing boilers. Modern condensing system boilers are more than 90% efficient at converting the energy stored in gas, into heat. This compares to non-condensing boilers which can be less than 70% efficient. Installing an A rated condensing system boiler in place of an old inefficient non-condensing boiler can result in savings in your heating bills of more than £300 per year. System boilers form part of a sealed central heating system and so you do not require a cold water expansion tank in your loft. This frees up space and removes the possibility of water leaks in your roof space and the risk of freezing pipes in your loft. System Boilers are more suitable to larger homes where the demand for hot water may be high. This is because hot water is heated and stored for later use rather than being heated up on demand as is the case with combi boilers. Because systems boilers require a hot water cylinder you can have the luxury of an immersion heater as a back-up source of hot water. An immersion heater will provide hot water if your system boiler is not working or if it is switched off during hot weather. The need for a hot water tank with system boilers can be a disadvantage if space is limited in your home as it will normally require its own cupboard. System boilers are more expensive than combi boilers. Because hot water is stored before it is used there is potential for heat loss which is inefficient and can be more expensive than providing hot water on demand as combi boilers do.